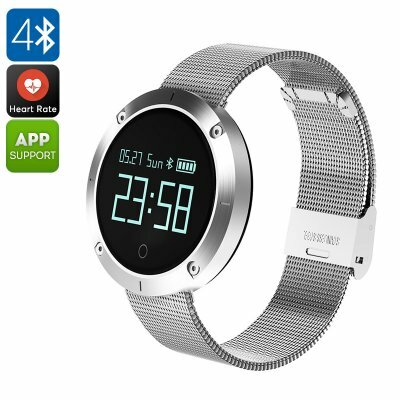 Successfully Added UNIK 2 Bluetooth Watch - Pedometer, Calorie Counter, Sleep Monitor, Sedentary Reminder, Blood Pressure, IP68 to your Shopping Cart. The UNIK 2 Bluetooth watch is an advanced fitness tracker that treats you with a wide range of health features. With this sports watch at your side, you’ll always have your own personal trainer at your disposal. Whether you’d like to gain muscle, lose weight, or work on your cardio – this sports watch makes sure you’ll meet your fitness goals. It furthermore has a waterproof IP68 design. Thanks to this, you’ll be able to use it in all weather conditions. This means that rain or snow will no longer stop you from heading outside for your upcoming run or cycling session. Thanks to its Bluetooth connectivity, this smart watch can be easily synchronized with your smartphone. Once paired, you’ll receive incoming call and message notifications. Thanks to this, you’ll always stay connected even while you’re at the gym. You’ll be able to use this smart watch with both iOs and Android phones. Its 0.95-Inch touch screen lets you easily browse through all the health options this Bluetooth watch has to offer. Along with its 120mAh battery, you’ll be able to make use of all these smart health options for multiple days in a row. For those of you who are struggling to meet your daily activity levels, this Bluetooth sports watch packs an advanced pedometer. This health feature provides you with detailed information on the number of steps you took throughout the day and distance covered. Additionally, it will show you the number of calories that you’ve burned throughout the day. Thanks to this, you’ll always be able to meet your daily activity levels and meet your future activity goals in up to no time. To make sure that you’ll never miss out on your exercise sessions again, this sports watch comes with a sedentary reminder. Your fitness tracker also comes with a heart rate monitor which will provide you with accurate readings of your current heart rate. Based on this, you’ll be able to adjust the intensity of your upcoming workout to meet your personal capabilities. A sphygmomanometer is furthermore in place to check your blood pressure at any given moment. No matter your fitness goals, with this Bluetooth watch at your wrist, you’re sure to meet them in no time. This sports watch comes with a 12 months warranty, brought to you by the leader in electronic devices as well as wholesale electronic gadgets..